An extension of the widely popular Acuvue Oasys contact lenses, Acuvue Oasys for Astigmatism offers the same comfort and convenience for patients with astigmatism. Thanks to Acuvue's unique Hydraclear Plus technology, these lenses embed a higher volume of moisture-rich wetting agent and are ultra-smooth so every blink feels almost like you're not wearing contacts at all. 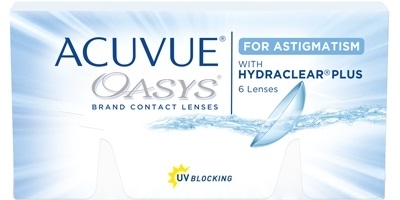 Acuvue Oasys for Astigmatis block at least 90% UV-A and 99% UV-B radiation and the lens's silicone hydrogel material provides 98% of available oxygen to the open eye.